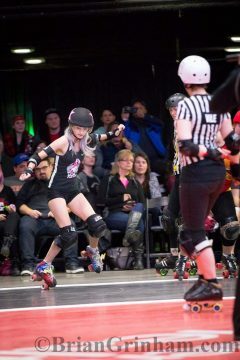 This month’s featured skater has been involved with QCRG since the very start, Jiffy Pop. Jiffy Pop (Jiffy for short) and her team the Saucies are currently undefeated. They have an upcoming on March 8th against the Alley Kats. Jiffy has played on several teams within the league and is one of the first Junior League graduates. Jiffy is a fantastic Jammer who will not hesitate to make that apex jump and leave opponents behind with her incredible speed. A fierce competitor, but an extraordinarily kind person both on and off skates Jiffy has an incredible passion for roller derby and is always willing to help. 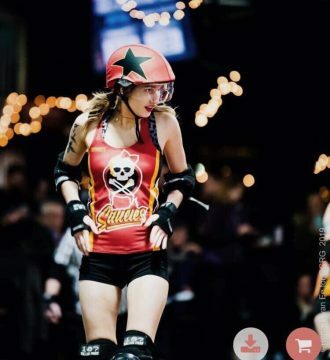 How did you get started with roller derby? I started skating in 2012, but I got started in 2006 when my mom started the Queen City Roller Girls. I always wanted to play since she started it, I watched every single game, was in the locker rooms, getting an inside look at what teams looked like, and I really wanted her to start a junior league. We saw that some were popping up around the area. She started working on it in 2011, it got started in 2012. Me and my sister were the first to join, we had 2 teams and a good amount of skaters that year. 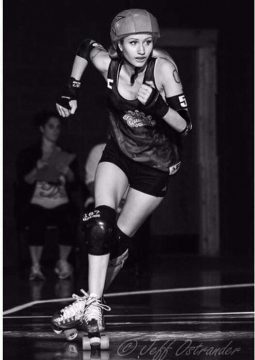 What are your hobbies outside of roller derby, do you have any? 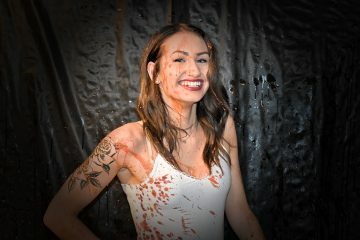 Outside of roller derby? Not really. I really just hang out with my dogs a lot, like taking pictures with them and just doing a lot of stuff with my dogs. But nothing to crazy outside of derby. What would you say has been your biggest challenge moving up from the junior league to the adult league? I’d say my biggest challenge would be people taking into consideration how much experience I have. A lot of people when they hear about juniors moving up they think they don’t have a lot of skill or experience, but junior play is actually very competitive. I played in the Junior Olympics and there were a lot of good skaters there, and some of the junior teams I’ve played with are on par with adult skaters. So I’d say being taken seriously by other skaters. I feel like people see juniors as rookies, when we’re not really rookies. We’re new to the adult league and it’s a lot different, but skill wise it’s similar. If you could change one thing about roller derby, what would it be? There isn’t really anything I’d change about the sport, but maybe peoples perspective of the sport. I’d like to see it be taken more seriously as a sport. A lot of people think of derby as a hobby or something you just do on the side. A lot of people put a lot of their time into it, especially WFTDA high level teams and a lot of the home teams do too. So I’d really like to see it taken more seriously like mens sports. People tend to see women’s sports a little differently but we definitely put in a lot of work. We do off skates training, put in a lot of time for practices. It’s a lot of time and effort and I feel like people don’t see it that way. That’s what I’d change. You’re on the Saucies this year, and your mom was on the Saucies, how do you feel about playing for the team? Do you feel a strong connection to it? Yeah, I’ve always had a connection to the saucies because of my mom. Although the teams have changed so much, it’s still pretty cool. I get to wear her old merch and rep all that so it’s really cool. It’s pretty exciting, I’ve been a Saucies fan since my mom played on there so it’s cool to call myself a Saucie. Last season you got to travel with the Lake Effect Furies to Georgia for playoffs, how was that experience? That was really cool, although I wasn’t exactly on the team it was cool to get an inside look at what the team looks like. It gave me a good idea of what being a fury is like. I participated in all the pregame stuff, all the off skates warmups, all the team talks. I saw how serious they took it and it was pretty cool to be part of that travel team experience. Unfortunately I didn’t play, but it was still very cool to get to watch and be on the bench. It was awesome. This season you made the Lake effect Furies how excited are you to be playing on the travel “A” team? It’s very exciting, I’m very honored to be on the team this year. It’s something that I really wanted to do for a long time. When I started Juniors, my goal was to be a Fury. It’s exciting to finally get there. Now I feel I can improve even more in my skills. The coaches are great this year. We’ve got Laci Knight, she’s a top roller derby skater from Team USA, her input is so important, Guy and Bricks have tons of experience too. It’s pretty cool to work with awesome coaches and awesome skaters. It challenges me more and more every practice. Do you expect it will be a big change going from the Subzero Sirens to the Lake Effect Furies? Oh definitely, Sirens was awesome too, I’m sad I couldn’t be a part of it this year. I love griff and papa, their coaching skills are amazing. Unfortunately I couldn’t find time for the Sirens too this year, but I’m very excited for the Furies, it will definitely be a jump up. So what is it like going up against your sister? Do you two get very competitive outside of the game, or do you leave that all on the track? I’d say we leave it all on the track. Before games we always get ready together, and talk about how we think the game’s gonna go. We never really talk about going against each other until we’re on the track and even then it sort of leaves your head. I just mostly focus on getting through the pack. So I don’t really focus on my sister being out there. Although she is a crazy good blocker, so it’s hard not to think about it. We do get competitive but we also do love playing with each other on the Furies, and previously the Sirens, but it’s cool to mix it up. When you’re skating, you tend to very quickly become a fan favorite. Does that fuel you during games, is it distracting, or a lot of pressure? I say it fuels me more than anything. One thing I love about sports in general is the crowd, the cheering, the excitement you get from it. So I’d say when I get that from the crowd it does fuel me a lot. I feel like I build off the energy from the people in the audience. I definitely say it fuels me. It’s super cool to take pictures with people after. I’m like “Really, you want a picture with me?” It’s a lot of fun. Do you personally have any favorite derby players? Yes definitely. Well my all time favorite players I’d have to say are my mom when she played, and my sister, who definitely inspires me to be a better skater. WFTDA level wise I’d have to say Loren Mutch from Rose City and Blackman from Denver. They’re both junior graduate skaters. Especially Blackman, she is a blocker and when I do block I relate to her because of her size. She’s a smaller player so it’s cool to watch her skate because I pick up things from watching what she does. And Loren Mutch is just so quick it’s unbelievable, I don’t know how she does it. And of course all of the Lake Effect Furies, the Subzero Sirens and everyone else in QCRG are my favorite skaters. They’re all awesome to play with. 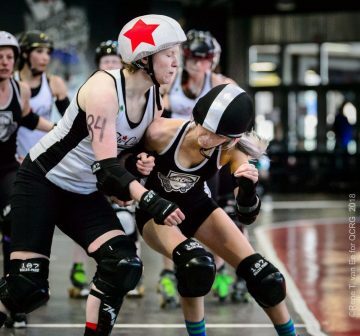 When you play, you’re usually a Jammer, what is your favorite part about being a jammer? I’d say my favorite part about being a jammer is that you don’t get coached on how to jam exactly. Every jammer has their own style, so it’s cool to build your own style when jamming. So I’d say that’s my all time favorite part, you do work with your team, but it’s cool to work on your own stuff, like footwork. So I’d say it’s definitely being able to develop my own style. Do you think you’ll ever switch to being a pivot or a blocker full time and stop jamming? I don’t know if I’ll be able to stop jamming. I’m thinking maybe in the future of taking a home season to block a little or pivot just to see how I like it, but I definitely have my heart set on jamming, I always have since I started. I do love blocking as well, it’s cool to work with everyone a little more, and I think it’s important to learn both positions because both positions help each other. They correlate well, when you learn how to jam as a blocker you learn what a jammer might do and when you block and you’re a jammer, it’s good for jammer defense. In your derby career, what stands out as your favorite derby moment? So far I’d have to say the AAU Junior olympic games. It was pretty cool to work with Teflon Donna and Devoida Mercy, they were awesome coaches. I got to play against skaters from all over the world. That was definitely a favorite moment. It was cool to work with skaters I never worked with before from different leagues that I otherwise would never have played with. It was definitely a cool experience. We placed 6th out of 8th, which is not last! It was awesome, and really fun. Do you have any long term derby goals? I’d say getting some more high level play, which I’ll be getting with the furies. It’s going to be cool going to playoffs and hopefully jamming more against higher level teams. My goal is definitely to work on my footwork more and my off-skates training because all that helps in becoming a better skater overall. Definitely just work on everything and keep improving myself. 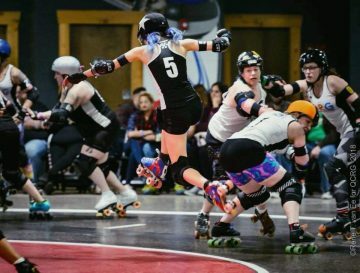 There are some pretty cool roller derby venues, do you have a favorite place you’ve played? Atlanta, GA was pretty cool. The furthest I’ve travelled was Dallas TX, that was pretty cool. It was an amazing venue. But honestly of all the places, my favorite venue I’ve ever played in is Buffalo Riverworks. It’s pretty cool to be in a sports venue, and we get a good crowd here. We get a sports crowd and that goes along with getting that good audience that fuels everyone. I think we get that here, and I think it’s really cool. So my all time favorite place to play is definitely Riverworks, and the coolest place I’ve travelled to was Atlanta. 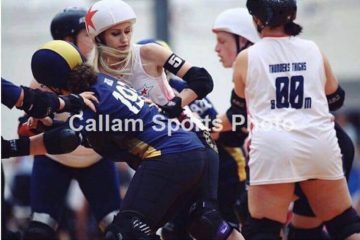 Copyright © 2019 Queen City Roller Girls · Buffalo, New York.